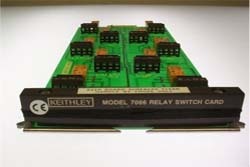 This Relay Switching Card is a non multiplexed switching card with ten independent and isolated channels. Each channel switches 2 pole Form A relays and can be user changed for either Form B or Form C configuration using jumpers. The switch specifications are well suited for applications such as power line switching, controlling external circuits and devices, and switching signals where multiplexing is not desired. Each channel is terminated with a screw terminal block that “quick disconnects” from the card.